Q. Do I need to pre-register for the Troop 260 / Crew 9999 Merit Badge Day? A. Yes!! Merit badge classes are first come, first served and will fill up prior to the event. Be sure to review all prerequisites and double check that your Scout needs/wants the merit badges you sign him/her up for. There are NO refunds for cancellations and NO class changes after you’ve registered. Q. How many merit badge classes can I take? A. All of our merit badge classes are half day (3 hour classes) with the exception of First Aid which is a full day class. You may select one all day merit badge session OR a maximum of two 1/2 day merit badge sessions. If you choose two merit badge sessions, you are limited to registering for only one Eagle Scout-Required merit badge session (denoted by an asterisks). Q. What is included with my registration fee? A. The $40 registration fee includes up to two merit badge classes and an optional lunch. Q. Can I only come for half the day and take just one merit badge class? A. Yes. When registering, you would select the merit badge in the AM or PM session you would like to take and select “none” for the AM or PM merit badge session you do not want to take. Please note that the $40 registration fee remains the same. An optional Lunch is still included. Be sure to make your lunch selection when registering. Q. Can I cancel my registration and get a refund? A. 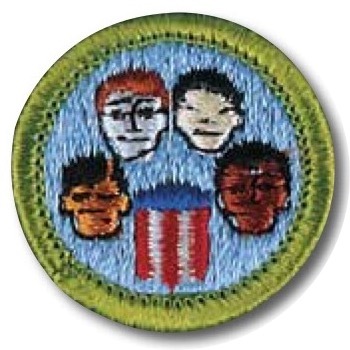 All Merit Badge Day registrations are final. There are NO refunds for cancellations. Q. Can I cancel my registration and get a credit toward a future Merit Badge Day event? A. No, all Merit Badge Day registrations are final. There will be NO credits for future events. Q. Can I change my class selections after I’ve registered? A. No, all Merit Badge Day registrations are final. There are NO class changes after you’ve registered. Q. What are the lunch options? A. When registering, you will be able to select your lunch from the following options: Hot Dog, Vegetarian, Gluten Free or None. All menu options come with fruit, chips and a bottle of water. Q. Will other food or snacks be available? A. Yes! We will have a snack bar, which will offer coffee, hot cocoa, tea, Krispy Kreme donuts, hot dogs, nachos, candy, chips, soda, & water. All items are $1, except for hot dogs and nachos are $2. Be sure to bring cash if you would like to purchase something from the snack bar. Q. Who is sponsoring the Snack Bar? A. Our snack bar is sponsored by a Better World. The mission of a Better World is to remind others what’s truly important in this life. They donate a portion of their profits to assist the homeless, help with care for sick children, foster the arts in schools, and provide student scholarship programs. Q. How early should I arrive to Check in? A. Check in begins at 7:00 am for the all day and morning sessions. The flag ceremony begins at 8:30 am. You’ll want to give yourself plenty of time to park and turn in all necessary paperwork. If checking in for just the afternoon session, you’ll want to arrive by 12:00 pm. – 5 non-perishable food items for Feeding America! Q. What is the dress code for Merit Badge Day? A. Scouts should be dressed in their Field (Class A) uniform and closed toe shoes. Scouts taking the Sports and Athletics merit badge class can wear their Class B t-shirts underneath their uniform and take off their uniform during the physical activities in class. Q. What if I can’t get my prerequisites done before Merit Badge Day? Will I still be able to get my blue card signed off and earn the merit badge? A. Scouts need to complete all of the prerequisites required for their merit badge and be able to show proof of completion to get their blue card signed off by the merit badge counselor. It’s still okay to come take the class if some prerequisites are not met. In this case, the Scout would get a partial sign off on the blue card. Once all of the requirements are met, they can get a full sign off at a later date. Our merit badge counselors will share their contact information during class so they can be contacted by Scouts later, if needed.